A paper outlining the research, titled ‘An Extensible Interface for QM/MM Molecular Dynamics Simulations with AMBER’, was featured on the cover of the January 15th issue of the Journal of Computational Chemistry. 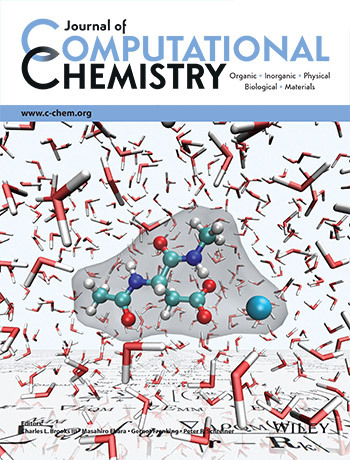 The journal cover shows a calcium ion coordinating to aspartate, a model for proteins in aqueous solution used by the authors to demonstrate features of the software. The multi-scale QM/MM equations governing the implementation are visible on the surface that extends to the horizon. Authors of the new study include SDSC’s Goetz and Ross C. Walker, an SDSC research professor and adjunct associate professor in UC San Diego’s Department of Chemistry and Biochemistry; as well as Matthew A. Clark, who developed part of the software during his internship with Walker and Goetz, contributed to the research as part of SDSC’s Research Experience for High School Students (REHS) program and later as an undergraduate research intern.